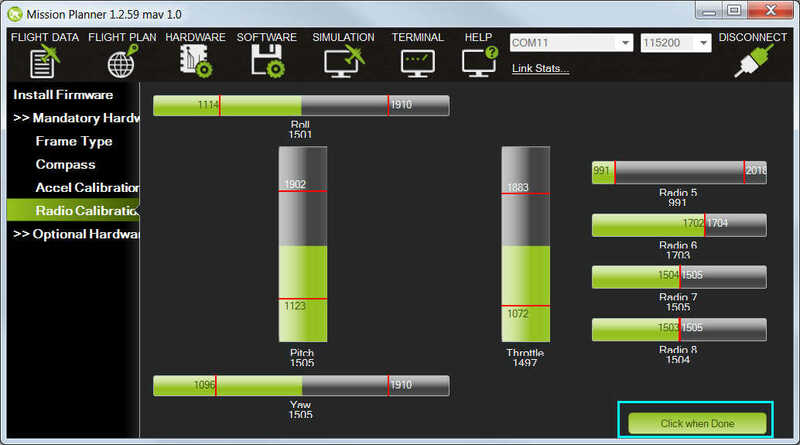 This article shows how to perform radio control calibration using Mission Planner. RC transmitters are used to control vehicle movement and orientation. Copter and Plane minimally control throttle, pitch, roll and yaw, while on Rover we just control throttle and roll. Each of these control signals are mapped to transmitter stick/switch(s) and in turn to autopilot channels from the connected receiver. Calibrating each of the transmitter controls/channels is a straightforward process - simply move each of the enabled sticks/switches through their full range and record the maximum and minimum positions. 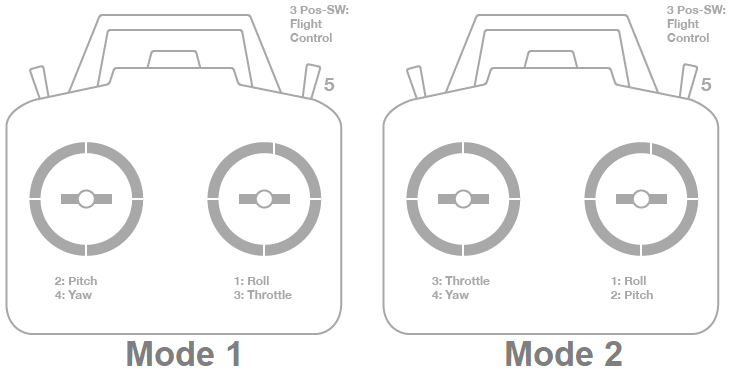 Mode 1: left stick controls pitch and yaw, the right stick will control throttle and roll. Mode 2: left stick controls throttle and yaw; the right stick will control pitch and roll. Rover users may prefer to control both throttle and roll from the same stick. Channel 8 (default): Flight modes. Mode selection can be mapped to any RC channel using the MODE_CH parameter. Unused channels can be mapped to control additional peripherals. The default channel mappings can be changed using the instructions in RCMAP Input Channel Mapping. Once you’ve calibrated the flight mode you can use the instructions in RC Transmitter Flight Mode Configuration to specify which vehicle modes are enabled by each switch position. For safety reasons you should disconnect the battery and/or remove propellers before preforming radio calibration. Centre trims in manual RC mode before preforming RC calibration. If trims are not centred you may need to do the RC calibration again after you have used the vehicle (this is easy to do at the field). Trims are centred when a moving vehicle does not change direction/speed/orientation when travelling hands-off with all controls/sticks in neutral positions. If there is any deviation in direction, speed or orientation, adjust the associated servo to compensate. Connect the autopilot via USB and turn on your RC transmitter. Verify that the transmitter is bound to the receiver (the receiver displays a solid green light) and that it is set to use the correct model for your vehicle. Open Mission Planner’s INITIAL SETUP | Mandatory Hardware | Radio Calibration screen. 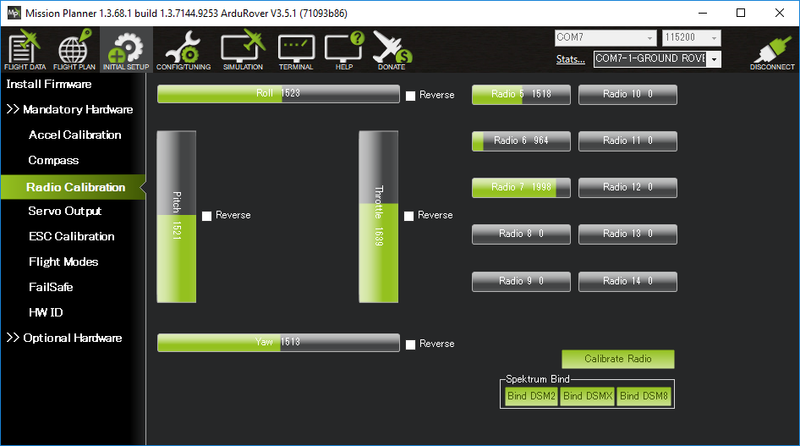 If your RC receiver (Rx) and transmitter (Tx) are bound, you should see the green bars move when you move the transmitter sticks. no lights - may indicate that it is incorrectly wired to the autopilot (look for connectors that may have been inserted upside down). red or a flashing green light - may indicate that your RC transmitter/receiver need be bound (see the manual that came with your RC equipment for instructions). a solid green light - recheck the autopilot is connected to the Mission Planner and if the bars are still not moving, try clicking on the Calibrate Radio button. Open Mission Planner’s INITIAL SETUP | Mandatory Hardware | Radio Calibration screen. 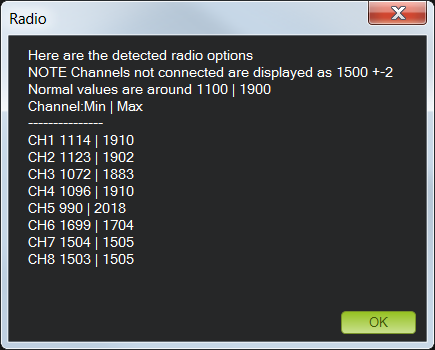 Click on the green Calibrate Radio button in the lower right of the window. Mission Planner will display a prompt to check radio control equipment is on, battery is not connected, and propellers are not attached. Select OK.
Mission Planner: Select Calibrate Radio and OK to begin calibrating. You should also calibrate the channel you have selected for controlling vehicle mode, and any other channels you have connected to the autopilot. Servos should move in the same direction when under autopilot control as they do in MANUAL mode. If not, select the Reverse checkbox for the associated channel. Select Click when Done when all required channels are set at the minimum and maximum positions. Mission Planner will show a summary of the calibration data. Normal values are around 1100 for minimums and 1900 for maximums. Turn off your transmitter and disconnect the battery if it was connected.